For over a decade, David M. Handy Events has been dedicated to planning extraordinary weddings, events, and fundraisers for their devoted clients. Founder David, along with his husband Donald, combined their background in design and a keen eye for detail to ensure every celebration is one to remember. Originally located on Nantucket Island, the firm has recently expanded to Boston, and we couldn’t be happier to have the event guru right in the heart of the city. Now, with the holidays right around the corner, David is sharing his Do’s and Don’ts for hosting your next soirée this season. Always chill your white wine and champagne the night before in your refrigerator. Dunking the wine in an ice bucket destroys the bottles’ labels. When creating the menu, come up with items that can be prepared in advance and served at room temperature. This will limit the amount of time you’re away from your guests during the evening. Always get double the amount of ice that you think you need! If you don’t have room in your freezer, place the ice in a cooler in your garage or by your back door. 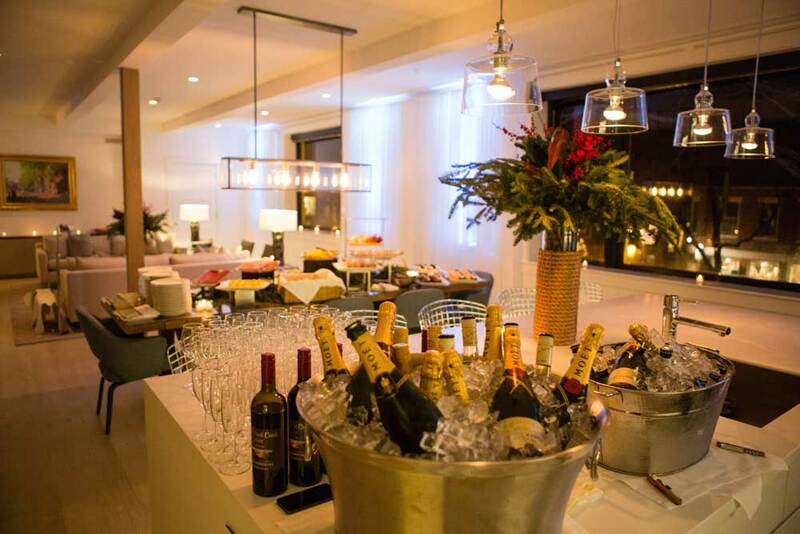 Make sure that any overhead lighting is dimmed, lamps are all on, and candles are lit prior to guests’ arrival. Please be sure to turn off all fluorescent light—no one looks good under it! As soon as you greet your guests at the door, they (and you) should feel relaxed. Have 1 or 2 signature cocktails available, something fun and seasonal! Note: if you can make a big batch in advance, this will allow you to be more available for the party conversation. Seating, seating, seating! We love to assign seats at our dinner parties. This takes away any awkward moments (“where should I sit”) when guests go to sit. Sometimes we like to split up couples so that people can get to know other party guests better. Don’t serve drinks in inappropriate glasses. IE: You would never want to serve a guest bubbles in a rocks glass. Don’t let your guests guess where the powder room is located. When you take their wrap or coat, let them know that the powder room is just down the hall on the left. Don’t forget introductions! Always introduce your party guests to one another upon arrival. Then we always try to use guests’ names over the course of the evening. This is a subtle, helpful tactic, if it’s a crowd who doesn’t know each other well and names could be forgotten. Don’t leave the clean up until the end, clean as you go! You don’t want your guests to feel the need to stay and clean up, because there’s piles of dishes, pots/pans etc in the sink. Don’t sit in silence. Create a fun, seasonal playlist. Have the music on and at an appropriate level so that guests can talk over it. Don’t run out! Make sure that when choosing the beverage offerings that you keep it simple. 2 whites, 1 red and of course lots of bubbles! If including a full bar, vodka, gin, rum, scotch, tequila + of course mixers and garnishes.